Update 29th June 2:15pm: Both Palestinian activists have a court date set in Ofer military court tomorrow. Update 29th June 1:00pm: The Two Palestinian activists are now currently being held at HaSharon Prison. Update 29th June 09:00am: The two Palestinian activists are currently being held at Jalameh prison. They may or may not have court on Sunday but will not be released before then. Update 29th June 2am: The international activist arrested at the protest was released last night. Update 29th June 00.45am: The two Palestinian activists are currently being interrogated at Giva Binyamin police station. 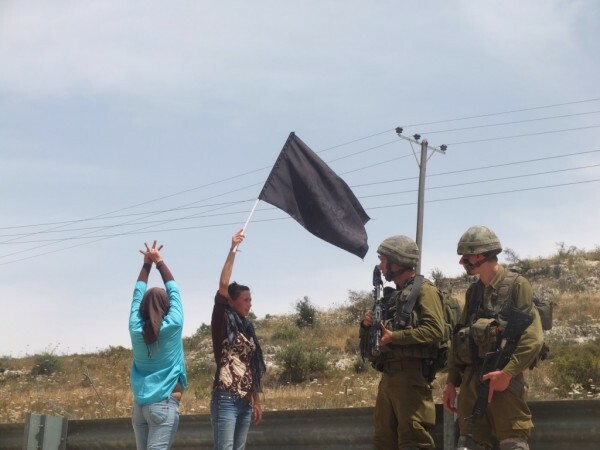 During the June 28th demonstration in Nabi Salih, after Friday prayer had finished, the Palestinians once again began their resistance against the illegal Israeli occupation. As usual, their demonstration was met with high levels of violence; disproportionate teargas was fired and foul smelling skunk water was shot onto homes. Two Palestinians and one international were arrested. They are currently being held in Binyamin police station. 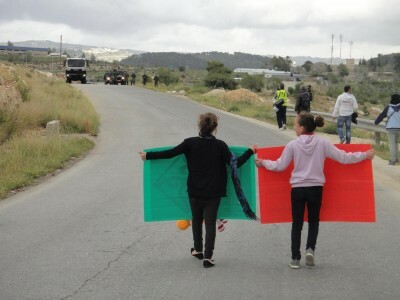 At around 1:30 pm demonstrators began marching towards the stolen water spring of Nabi Salih, currently occupied by Israeli settlers from the nearby illegal settlement of Halamish. As soon as the demonstrators began to descend the mountain, two military jeeps began using their tempest tear gas attachments, firing excessive tear gas canisters directly at unarmed marchers. The military jeeps then began to aim directly at those who chose to stay on the road, shooting canisters at head height and disregarding the flammable nature of the local petrol station. 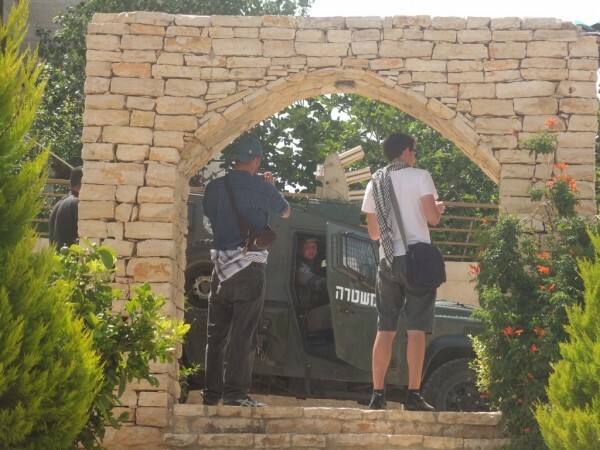 The skunk truck and two jeeps then invaded the centre of the village, including the olive groves [as seen in video] which then allowed the skunk truck to maneuver freely, shooting at all homes and demonstrators in its wake. After this, those demonstrators that had reached the bottom of the mountain close to the spring were faced with a large group of soldiers. Demonstrators confronted the soldiers; however as the video shows, the soldiers disregarded the rights the Palestinians have to their land and proceeded to aim their weaponry at demonstrators. 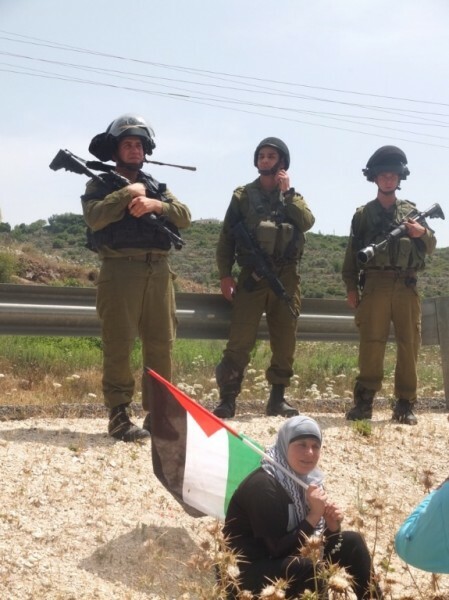 Two Palestinian women, including prominent Nabi Saleh activist Nariman Tamimi, and one international man, believed to be from Spain, were arrested for no reason other than resisting the occupation. It is currently understood that these three have been transferred to Giva Binyamin police station, where they are still currently being held. The village of Nabi Salih has been demonstrating against the theft of the natural spring and the occupation since December 2009. Israeli forces violently suppress the weekly Friday protests by shooting tear gas canisters, skunk water, sound bombs, rubber coated steel bullets and even live ammunition at protesters. Two people have been killed, Mustafa and Rushdi Tamimi, and many others severely injured. Resident Bassem Tamimi, has spent 17 months in Israeli jails, merely for being a prominent activist at the protests. After more than three years and despite the repression, Nabi Saleh continues to fight against the injustices of a brutal military Israeli occupation. 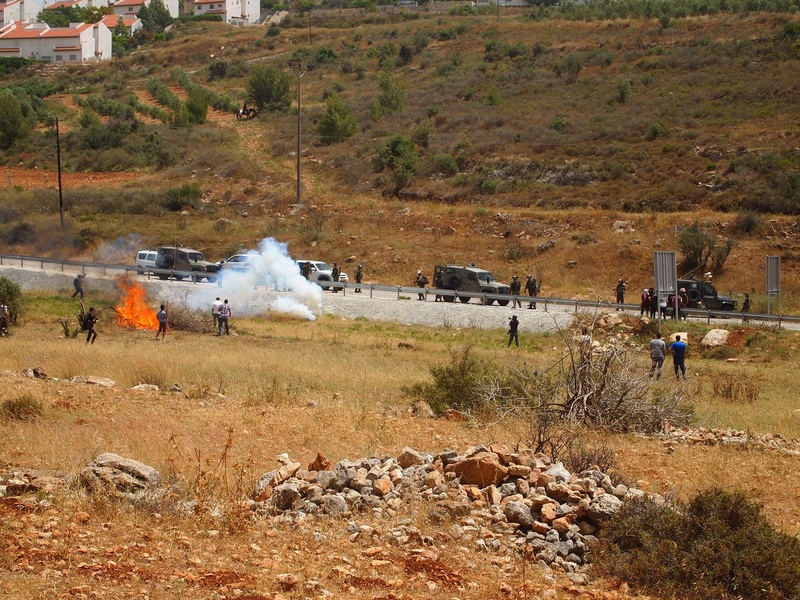 Unlike in previous demonstrations, two army jeeps invaded Nabi Saleh today an hour before the demonstration was due to begin. After midday prayers, over 60 villagers, joined by a number of Israeli and international activists, marched from the center of the village along a path through the olive groves on to the main road. The march then diverted into the valley below the village and proceeded towards the olive groves located by road 465, the road closest to the Halamish settlement that occupies Nabi Saleh land. Reaching the olive groves, the villagers started clearing the lands around the olive trees and several army and border police jeeps arrived. One of the soldiers shouted at the crowd with a megaphone declaring the area a close military zone. The nonviolent protesters continued working the land, but Israeli forces began shooting tear gas canisters at them. Despite the crowd dispersing around the valley, Israeli forces continued shooting tear gas canisters and then began aiming directly at people. The canisters ignited the surrounding agricultural land on fire and, with the high temperature and strong winds, the flames soon spread throughout the valley. 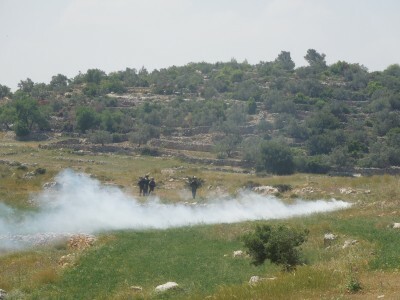 A number of villagers went peacefully towards the soldiers to protest the denial of access to their own land, but were soon met with stun grenades thrown, tear gas canisters shot and skunk water sprayed at them. Israeli forces also launched several rounds of multiple tear-gas canisters from jeep-top launchers. As a result, three people were treated for tear gas suffocation by Red Crescent personnel. When the valley was full of tear gas, protesters marched back to the village where three border-police officers remained shooting tear gas canisters first at young boys still near the valley, and then further tear-gas and rubber-coated steel bullets indiscriminately into the village. The protest finished at around 4:30pm when Israeli forces retreated back to the main road. The village of Nabi Saleh has been demonstrating against the theft of the natural spring and the occupation since December 2009. Israeli forces violently suppress the weekly Friday protests by shooting tear gas canisters, skunk water, sound bombs, rubber coated steel bullets and even live ammunition at protesters. Two people have been killed, Mustafa and Rushdi Tamimi, and many others severely injured. Bassem Tamimi, from Nabi Saleh, has spent 17 months in Israeli jails, merely for being a prominent activist at the protests. After more than three year and despite the repression, Nabi Saleh continues to fight against the injustices of a brutal military Israeli occupation. Today Palestinian, international and Israeli activists marched towards a well that was stolen from the village of Nabi Saleh by the establishment of Halamish illegal settlement. As activists walked down the hill towards the well, Israeli soldiers shot tear gas at them which set fire to the ground around them. As they did so , soldiers sang “we wish your whole village would burn down”. Activists were then blocked from reaching the spring by a large group of Israeli soldiers. At the same time, a skunk water truck entered the village spraying several of the homes in the village with the putrid smelling liquid. Eight international and Israeli activists were detained by Israeli soldiers who confiscated their passports. They were released within 30 minutes. Long after the demonstration was over, two Israeli military vehicles and several Border Policemen entered the village and drove slowly around the neighbourhood in a bid to intimidate its residents. UPDATE 13th April 2013: The injured Spanish activist returned to hospital Saturday morning, after experiencing continued pain, dizziness and fatigue. 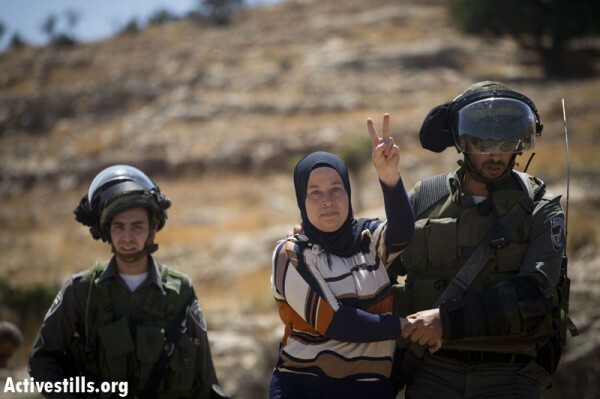 She had been shot three times with plastic coated steel bullets at Nabi Saleh demonstration the day before. She is currently under observation at the Rafidia Hospital in Nablus, being treated with antibiotics. Around one hundred Palestinians, joined by a handful of Israeli and international activists, participated in today’s demonstration in Nabi Saleh. After midday prayers, protesters marched from the centre of the village, deviating from their usual route and walking across the main road and up the hill, trying to reach the water spring stolen by settlers from Halamish settlement more than three years ago. By the time protesters reached the hilltop, several Israeli Border Police officers waiting and immediately started to shoot tear gas canisters and rubber coated steel bullets at them. 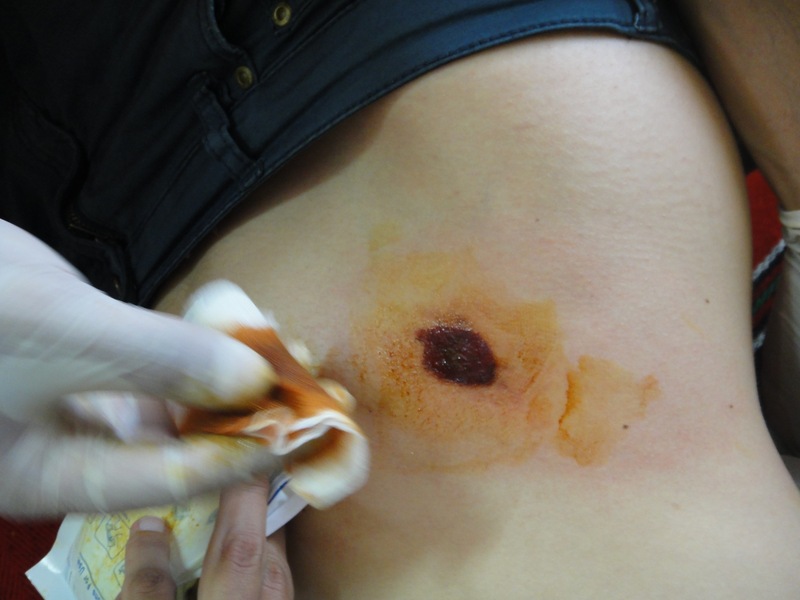 One Spanish international activist was hit by a rubber coated bullet in the right leg. 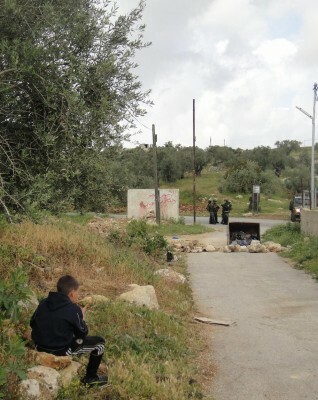 As people retreated from the hilltop back to the main road, Israeli forces continued shooting tear gas canisters. As protesters walked chanting and clapping towards a large group of Israeli military personnel and jeeps blocking the road, they were ambushed. Border police officers who had invaded the village shot multiple volleys of rubber coated steel bullets directly at unarmed protesters from a vantage point on top of the hill, as protesters retreated. The same international activist who had previously been shot was again shot with two bullets; one in the ribs on the back and the other on the stomach. This breaks the Israeli forces’ own rules of engagement which state that rubber coated bullets should be fired at the legs. Despite the fact that officers clearly saw that the activist was injured, they continued shooting rubber coated steel bullets along the road. The activist was immediately assisted by Red Crescent personnel and taken to hospital by ambulance. She is in good health condition, recovering from the injuries at home. Israeli forces continued shooting tear gas canisters and rubber coated steel bullets at protesters until three in the afternoon, when the demonstration finished. The village of Nabi Saleh has been demonstrating against the theft of the natural spring and the occupation since December 2009. Israeli forces violently suppress the weekly Friday protests by shooting tear gas canisters, skunk water, sound bombs, rubber coated steel bullets and even live ammunition at protesters. Two people have been killed, Mustafa and Rushdi Tamimi, and many others severely injured. Bassem Tamimi, from Nabi Saleh, has spent 16 months in Israeli jails, merely for being a prominent activist at the protests. After more than three year and despite the repression, Nabi Saleh continues to fight against the injustices of a brutal military Israeli occupation. On Palestinian Children’s Day, the kids of Nabi Saleh played a leading role in their village demonstration, holding banners and balloons, claiming their rights to a childhood free of oppresion and occupation. However, Israeli forces, as they regularly do, quickly suppressed the demonstration. As the crowd of protesters were marching along the road with the intention of going to their stolen water spring down the hill, Israeli border police accompanied by a skunk water truck started to shoot the malodorous water and tear gas canisters at the protesters. 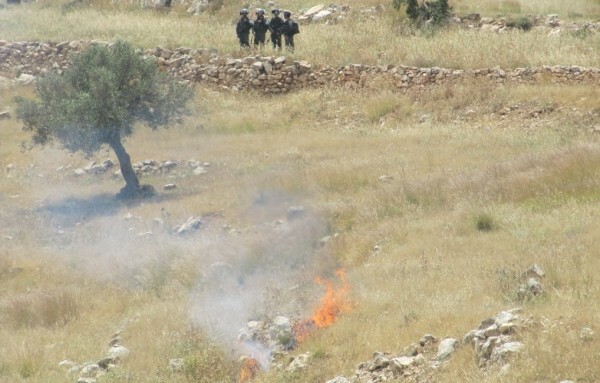 Border police officers, located on the main road and on the two hilltops beside it, continued shooting tear gas canisters for approximately an hour, after which they further invaded the village, chasing Palestinian youths down the hills on the other side of Nabi Saleh. A local journalist was severely pushed, pepper sprayed and had stun grenades thrown at him by Israeli border police officers whilst covering the protest. 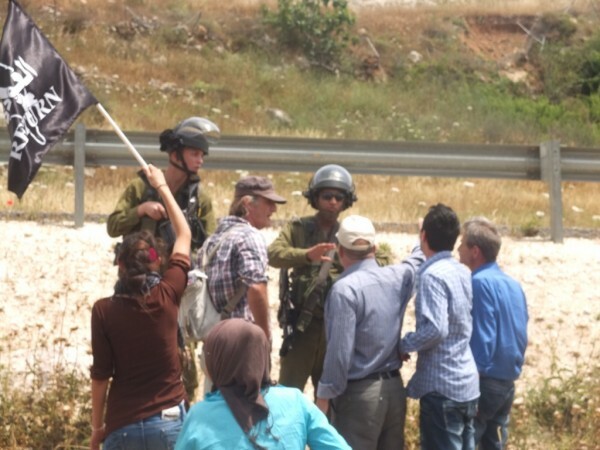 The demonstration finished at around 3pm when Israeli forces retreated from the village. Then, the children of Nabi Saleh, took over their streets to celebrate their day, claiming their right to a childhood without Israeli occupation. The village of Nabi Saleh has been demonstrating against the theft of the natural spring and the occupation since December 2009. Israeli forces violently suppress the weekly Friday protests by shooting tear gas canisters, skunk water, sound bombs, rubber coated steel bullets and even live ammunition at protesters. 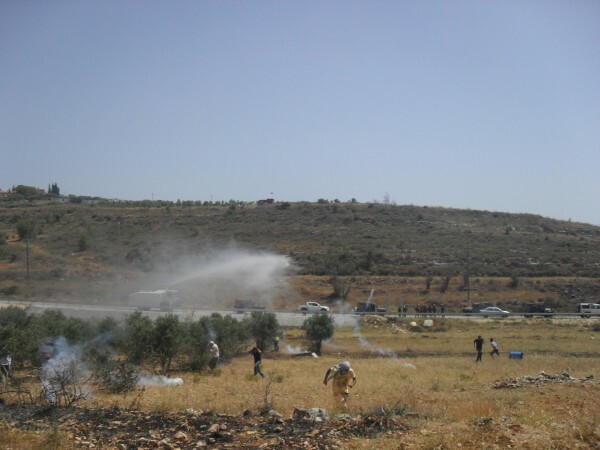 Two people have been killed, Mustafa and Rushdi Tamimi, and many others severly injured. Bassem Tamimi, from Nabi Saleh, has spent 16 months in Israeli jails for the only reason of being a prominent activist at the protests. After more than three year and despite the repression, Nabi Saleh continues to fight against the injustices of a brutal military Israeli occupation. At 10 a.m. we arrived at Nabi Saleh to interview the neighbors about what had happened the night before. We found out on the internet that something was going on, thanks to Tamimi Press, a Facebook page created by a young designer who lives in the village. Walking down the main road our eyes and nose got irritated. We could still breathe the tear gas shot by Israel’s occupation forces throughout the night. 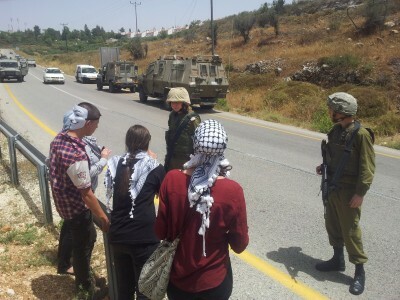 Around 6 p.m. a group of settlers tried to enter the village of Nabi Saleh. Seemingly, the reason was a fire started on the lands at the border of the the illegal settlement of Halamish. To be precise the fire was sparked on the side of the new extension where settlers are just now occupying with prefabricated units. For a couple of hours the youngsters from the village tried to avoid entering through the main street, until the army came. This resulted in various neighborhood vehicles being damaged by the stones thrown by the settlers. At that point, soldiers were blocking the roads. At 8.30 p.m. more than 50 soldiers entered the village and started shooting tear gas and sound bombs. Then an officer started to shoot real bullets shouting at his subordinates to do the same. At that moment the village was completely full of gas and 3 people had been hurt by the impact and the burns from the bullets. Among them were two women from the same family, whose house had been shot at directly.